The EU's chief Brexit negotiator has been speaking about the need for unity among EU members as they meet today to discuss Brexit negotiations. As we reported earlier here on the live page, UKIP leader Paul Nuttall has confirmed he will stand for election in Boston and Skegness in the general election. She says Theresa May has said the election is about removing her opposition to strengthen her hand and "do whatever she wants". "Well let us make sure we send a loud message from Scotland that we're not prepared to give a Conservative government a free hand to do whatever it wants to Scotland," she says. Ms Sturgeon says the Tories have given tax cuts to "the very wealthiest in society" while cutting spending for the disabled. She says this has been done with just a small Conservative majority. "We in Scotland must not allow the Tories a free hand to do even more damage to our country and to the fabric of our society." In the general election she says Scotland must make sure its voice is heard - "and loudly and clearly". She says the election matters to the future of the country and will determine whether Scotland "moves forwards or is dragged back by the Tories". Scotland's First Minister Nicola Sturgeon has also been addressing crowds. She says in the local elections on Thursday Scotland has the opportunity to remove the "dead suffocating hand of Labour". Mr Corbyn tells the audience that strong leadership is not about asking for more power - what he claims Theresa May is doing - but "equipping you with more power". He ends by imploring young people to register to vote. 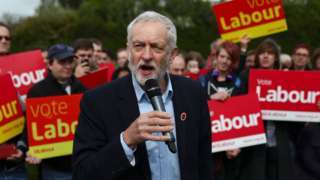 "Step up for Britain and vote Labour on June the 8th," he urged. Jeremy Corbyn accused Theresa May of having a "presidential bunker mentality".Image caption: Jeremy Corbyn accused Theresa May of having a "presidential bunker mentality". Mr Corbyn says he "respects his critics - when they make a reasoned case". He said they were doing what he did in the past when he often challenged the party's leadership. Mr Corbyn says it reminds him of the 1990s when the "political mainstream bought into Conservatives ideas about the market, finance and the economy". He says this ultimately left the UK with "no defence" to the global recession. Mr Corbyn says this experience showed him that if party leaders go unchallenged they can make "some of the most damaging mistakes". He accuses Theresa May of slipping into a "presidential bunker mentality". Mr Corbyn spoke about his track record as an MP since 1983. He said since he first became an MP he has not seen a sustained attempt to change what is "holding this country back". He did not expect to win the Labour leadership contest in 2015, he said, but since then Labour had "forced the Conservatives into one U-turn after the other" on issues including tax credits and disability benefits. Mr Corbyn says many people - particularly the young - are being "held back" in society. He says in a "fairer Britain" government would be "bending over backwards" to help those who are struggling and "unleash their potential". "You are the future after all - that is a priority every government should follow." Mr Corbyn says the audience needs to "step up" and register to vote. "Claim your future," he says. He says 2.4 million people are missing from the UK's electoral register and points out that barely 40% of 18-24 year olds vote. He says Conservatives are more than happy with this and "apathy and resignation" will secure them seats in the election. Mr Corbyn says the Conservatives are "cooking up" a "Brexit for the few" - one where any money saved is handed out to corporations and the super rich in tax cuts. He says where new trade deals are made they will drive down working conditions and food and environmental standards. "I think you can work out what will happen to the many in a rigid Brexit", he says. Mr Corbyn says the Conservatives do not want to talk about this "rigged system" and are "desperate" to make the election "all about Brexit". The Conservatives would rather make "incredible promises" about life outside of the EU rather than talk about a "scorecard of broken promises and neglect stretching back over seven years," he says. Labour leader Jeremy Corbyn is giving a speech in Whitechapel, east London. This election, more than any he has fought, will "define our times," he tells the audience. He reaffirms his slogan that the government has presided over a "rigged system". UKIP leader Paul Nuttall took his time to announce whether he'd compete in the general election, and then he was tight-lipped about where he would be standing. Now Mr Nuttall has announced he will standing in Boston and Skegness - the constituency that recorded the highest Leave vote in the EU referendum, at 75.6%. In a statement, Mr Nuttall said: "It is a great honour and a privilege to stand for UKIP in Boston and Skegness. "The constituency voted overwhelmingly for Leave inspired in part by the massive betrayal of our fishing industry by successive governments, something that today's Conservative Party led by Theresa May looks set to repeat. "I will make it my mission to stand up for the people of Boston and Skegness and ensure there is no backsliding on Brexit." In Leeds, Mr Farron will reiterate his claim that he could replace Mr Corbyn as leader of the opposition. He claimed the Lib Dems can replace Labour as Britain's main opposition party because Jeremy Corbyn is "demonstrably the worst leader in British political history". He has also said his party is aiming to regain the Scottish seats it lost in 2015. Mr Farron faces an uphill battle - the Lib Dems currently have nine MPs while Labour has 229. Theresa May is to make her first campaign visit to Scotland, where the Conservatives are hoping to make gains. She is expected to ask Scots to vote for her to "strengthen the Union", the economy and her hand in Brexit talks. Jeremy Corbyn, meanwhile, will urge young people to overcome "apathy and resignation", which he says only favours the Tories. 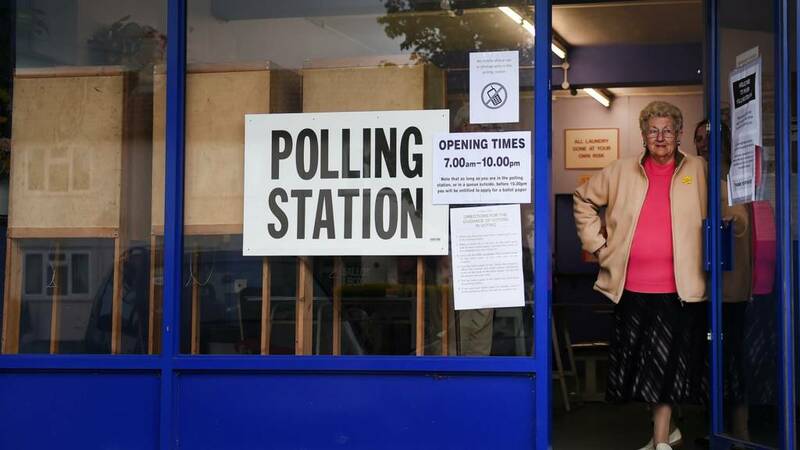 He will highlight figures showing 2.4 million young people are missing from the electoral register. 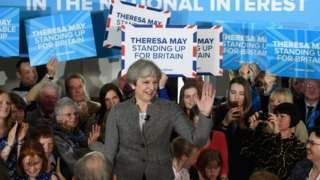 The prime minister speaks at a rally during her first election campaign trip to Scotland. Two of Jeremy Corbyn's key allies have not been selected for parliamentary seats under a fast-track process. His political secretary Katy Clark - a former MP - pulled out of the contest for Leigh, the seat Andy Burnham is vacating. Sam Tarry - a key figure in Mr Corbyn's second leadership campaign - was also passed over for Hull West and Hessle, vacated by Alan Johnson. The nominations are significant because they could determine if a left wing successor is appointed to replace Jeremy Corbyn in the event of him stepping down after the election. Failing to get Jeremy Corbyn supporters nominated could have significance beyond the next election. 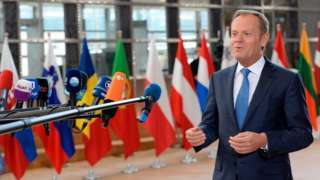 EU leaders are to meet in Brussels later to discuss a joint strategy for Brexit negotiations. The UK is the only member of the bloc not taking part in the discussions. The EU will insist that progress must be made in talks on separating the UK from the EU, before any discussions can begin about future trade relations. Official talks between the UK and the EU will not begin until after the general election on 8 June. The remaining 27 European Union members are meeting in Brussels to agree their Brexit strategy. Good morning from the politics live team. Here's a round-up of some of the political stories you're waking up to. An MP is standing down after reportedly telling students that homosexuality was "wrong" and "dangerous to society"